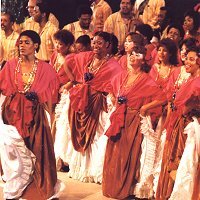 The choir on stage was doing David Rudder's Bahia Girl, one of those marvellous songs from his 1986 calypso debut year, the one where soca meets samba. The singers swung from side to side, playing imaginary pans, for that hopelessly infectious chorus. Pim-pi-lim-pim pay-bee-dee-bam-bam . . . The packed audience started to sway too, arms held high, tasting the sweetness of the rhythm and the melody, the reconnection with home. At the end, it rose to its feet cheering and demanding more. "De bam-bam song!" shouted a woman near the front, still swaying. "De bam-bam song again!" But the audience at Medgar Evers College in Brooklyn that night - the final night of the Marionettes Chorale's most recent US tour - was not all nostalgic Caribbean people exiled in New York. Far from it. One American choral director sought out conductor Gretta Taylor to enthuse about the choir's non-Caribbean work as well. Their performance of a classic North American choral piece - Randall Thompson's challenging Alleluia, its long rocking phrases completely unaccompanied - was the best she'd ever heard, so beautifully phrased and controlled, perfectly in pitch . . .
Just as touring steel orchestras still startle audiences when they delve into a Tchaikovsky overture or a Dvorák symphony, so people are still surprised to find world-class choral work from a Caribbean choir. Think Caribbean, and you think reggae, calypso, pan, zouk, meringue, cadence; "world music", rooted in folk culture and mass entertainment. You don't think of a choir singing Gabrieli or Beethoven, Leonard Bernstein or Olivier Messiaen, let alone turning from that to perfectly polished calypso arrangements, Broadway music, spirituals or folksong, without missing a beat. Caribbean music is in fact far broader than most people outside the Caribbean think. There is some very interesting work going on in jazz and crossover music, and there are some hugely popular jazz festivals such as St Lucia's. Many of the islands have biennial music festivals which give thousands of amateur performers a grounding in performance, especially accessible classics - choirs, pianists, singers, instrumentalists. Trinidad's Amoco Marionettes Chorale has long been in the vanguard of all this. Every year at the start of the Christmas season they pack Port of Spain's Queen's Hall for five or six nights with a programme that ranges from challenging classical and religious work, through stage music, folksong and spirituals, to carols and Caribbean music - arrangements of calypso, reggae or pan pieces. All this is packaged with Broadway or West End flair - full costuming, stage sets, festive decorations, choreography. Every few years they undertake an international tour to North America or Europe - not as often as they would like, but still good going, given the Caribbean's sadly devalued currencies. They have produced three full-length recordings, two on CD, with a new Christmas CD being released this fall. All the singers are amateur; few can read music; they practise in a local church or church hall for two hours twice a week, on Tuesday and Thursday evenings, come rain or shine; and yet the results can stand comparison with the best choirs from anywhere in the world (as the trophies brought home from international choral competitions in England, Ireland and Wales testify). 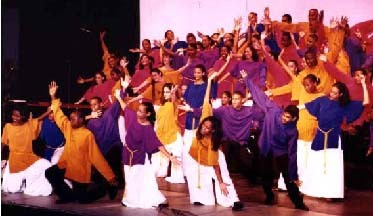 In 1995 they established a Youth Chorale of about 80 voices, drawn from schools across Trinidad, to spread the musical experience to a new generation and feed talent into the adult choir, which is also around 80 strong. Even with a generous corporate sponser - the local branch of BP/Amoco (whose regional headquarters are in Trinidad) has proudly backed the choir for 28 years - it's a tough challenge. To watch the Marionettes rehearse is to see exactly how it is done. Conductor Gretta Taylor - who has just completed 25 years as director - works her choirs very hard. She demands the same high technical standards as a choral conductor would in London, New York or Berlin - the same rigorous, relentless attention to breathing, voice production, phrasing, blending, tuning, developing the right style for the work in hand. Nobody is immune to her sharp tongue. But if she works her singers hard, she works herself harder: virtually all her spare time is spent searching for material, planning programmes, planning stage placements and movements, keeping up with choral techniques and new music (not least by attending events like the American Choral Conductors' Convention), making her own musical arrangements, rehearsing soloists. But the choir's fierce discipline and its endless search for quality are not the whole answer. The choir has been welded together as a community, with shared core values and experiences and a deep loyalty, and it shows, on stage and off. "It is sometimes hard to get people to understand that in a large group your opinion cannot always prevail," says the choir's manager Joanne Mendes, "and to accept that individuality has to be merged to some extent in a collective identity. But I think we all understand that pretty well now." Several members were with the choir when it started 35 years ago, in 1964, and dozens have sung with it for 10 or 20 years. Assistant director Susan Dore points to a unique spirit, a camaraderie, "that's almost a spiritual thing, even when the members are at their freest, fêteing or liming." Retired US general Colin Powell, watching as well as listening to the group on a recent Trinidad visit, called it a "rainbow choir" in which there seemed to be no barriers of race, religion, age or class. With the musical polish, flair and refinement that you don't expect to hear outside the world's great music capitals, backed by that group cohesion, the Marionettes are a formidable performing group. They often work with large Trinidad and Tobago steel orchestras like Amoco Renegades and Neal & Massy All Stars; but they have their own scratch orchestra too, featuring piano, keyboards, pan, wind, brass and percussion, with a separate folk group (guitar, cuatro, bass, maracas) for the Caribbean material. The Christmas production is only the climax to each year's work: there's often a mid-year production too, plus a series of other performances for churches and charities, public and national events. In this way, the Marionettes have managed to introduce Caribbean audiences to music they never dreamed they could like. One of the big problems facing an ambitious Caribbean choir is the lack of material. No Caribbean composers are producing choral music, and even good choral arrangers are hard to come by - the Marionettes are lucky to have percussionist Keith Coombs and musician Desmond Waithe to help with orchestral and folk arrangements. "But our biggest problem," says Gretta, "is accompaniment. Some of the work we do - like the choral finale of Beethoven's Ninth Symphony, which we did last Christmas - really needs the backing of a symphony orchestra. We have a youth orchestra here in Trinidad now, and we look forward to working with them in the future, but for the moment accompaniment is still a problem. It's harder to get the music across effectively - there are always listeners who find programmes too heavy or too light, and it doesn't help if we don't have the right forces to show them how the music should really sound." But the fact that audiences come back year after year shows that the Marionettes have hit a good balance between challenge and entertainment. "Our audience is always ready to listen," Gretta says. "Even if they find it hard to relate to new work, even if a few people come 'prepared to suffer', they will give the music a chance, and often they get to like it. Thirty-five years ago the Marionettes were confined to sentimental light classics: these days we can do quite difficult 20th-century work - Leonard Bernstein's Chichester Psalms or Missa Brevis, David Fanshawe's African Sanctus, Francis Poulenc's Gloria, Carl Orff's Carmina Burana - and get audiences to respond." This sensitive balance is vital if the choir is to keep audiences pleased and entertained without compromising musical integrity. It's the same with the singers. "Not all our members are familiar with classical music," Gretta explains, "and they sometimes feel they will not like or understand a new work when we start to rehearse. But usually, once they get involved, they do understand it, and they do come to like it, sometimes very much. They understand that there is real beauty in musical form and order, no matter what the style or the period. Our members really get a high from singing, whether the music is easy or not. You can see it before the start of a show. They just can't wait to start singing." The choir itself has progressed too over the years, not just in musical professionalism and sophistication: it has become less austere and defensive about its music, it is projecting better, it has freed up. "It's kicksier," laughs Susan. And now there's the Marionettes Youth Chorale, 80 youngsters brimming with energy and enthusiasm, who practise only once a week but have already produced their first full-length show and guest regularly with the adult choir. "This is my suicide bid," Taylor says, weary but elated after a long hot practice session. "But this is our future, this is the Marionettes' continuity. These youngsters have so much talent, you wouldn't believe. And they need avenues of expression, they need challenges to stretch their tastes and abilities. They need exposure to music and to the disciplines of performance. And they're having fun. I wouldn't wind this up now for anything."